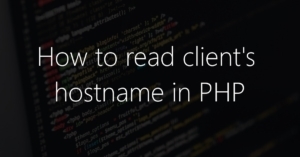 The following article is about how to use PHP to read out the client hostname, which is the computer name of a visitor. If you search in the internet, you will find out soon, that the whole thing is not so trivial. Either one gets simply wrong answers or one gets solutions, not in PHP but for example implemented in VBScript or it is said that it is not possible at all. But since it works, I would like to show you how to read the computer name, now. But before we look at the solution, let’s take a quick look at the suggested solutions on the internet and explain why they are wrong or not recommended. In this article, I want to show you how to disable the OPCache based caching for certain directories. (If you need a short introduction to the subject of OPCache, you should scroll down to the blue box in this article.) Although OPCache is a good idea in almost all cases, there are, as with many thing, situations where you should make an exception. Especially when it comes to the development or if a bugfix is to be tested, it can make sense to disable OPCache. However, since other projects that benefit from OPCache are often running on the same web server, a complete deactivation of OPCache for such test cases can not be an option. Therefore, this article is about how to disable OPCache on the directory level. Recently I wrote about how one can implement date comparison in PHP. In the article I presented two approaches. Firstly, using the strtotime() method and another with the DateTime class. Then, in the comments on the german division of this blog, it was pointed out that the strtotime() variant is probably faster. Because I wasn’t sure about this, I decided to make a small performance test and share the results with you in this article. How did I test the performance? Since the question aims on strtotime() vs. DateTime, the DateTime class is contrary to the strtotime() function. So because DateTime class offers more functionality, I had first to create the DateTime object and then get the timestamp of it, because the strtotime function gives a timestamp as return value and I wanted to compare the time needed to generate the identical output.